What is the most convenient method of delivery? Without a doubt, it is when you get your delivery right where you want it, so you do not have to go anywhere to pick up what you have ordered. The idea is the same with auto transport when you ship a vehicle from one state to another. You want your car to be picked up and delivered to the locations of your choice, and that is what door-to-door car shipping is for. Luckily, door-to-door shipping is the most common method of car transport. 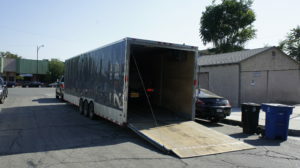 Philadelphia Car Transport provides door-to-door car shipping as our standard method of auto shipping. When you book auto shipping with us, just provide us with addresses of locations for the pick-up and delivery and we will organize the shipping between them. It sometimes happens that one or both addresses are not accessible for auto haulers due to safety or other reasons. If that is the case, we give you alternative locations to choose from, such as nearby parking lots. Our priority is always making our services convenient for you. If you wish, you can also request terminal to terminal Philadelphia auto transport. Our company has terminals in all major cities in the United States. At Philadelphia Car Transport, we will do all we can to fulfill your requests! Our agents will discuss all the details with you and make sure everything goes according to plan. Don’t hesitate to call us with any questions. Our team is always here to help! To get free quotes, call our office during normal business hours or request a free estimate on our website. We will be happy to ship for you!